Think about the relationship with your IMO or Field Marketing Organization (FMO) and how much of the following they do for you. I hear it time and time again from agents when I ask, "What do you need to be more successful?" The answer inevitably is, "More people to see." 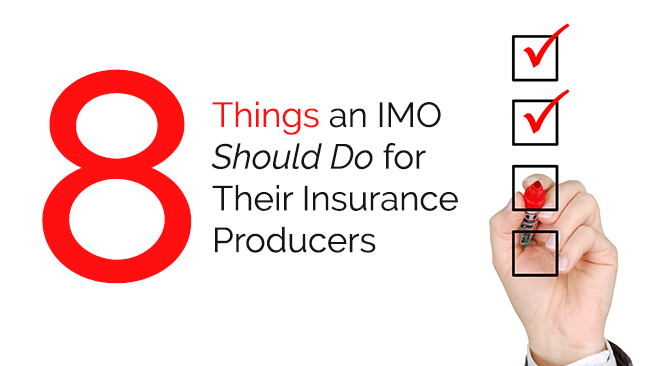 As an independent insurance agent, you should look to your IMO to provide you with access to proven prospecting programs. In order to grow your business you must spend money, but I encourage you to spend it wisely. Every insurance practice, regardless of its size, needs marketing and prospecting. When I hear an advisor say, "I can't afford any marketing," my response is, "Then you really can't afford to be in this business." Starting up any business requires capital, and if necessary, search out IMO partners that can provide you with reimbursements for your prospecting programs. Once you have a prospect, you need a proven and consistent way to move them through your practice. Of the thousands of advisors I've spoken with, a good 99% have told me they got into this business because they wanted to help people. What many advisors fail to realize is that improving and standardizing business processes directly leads to more sales, bigger sales and more referrals ... which means you get to help more people. Your IMO should be assisting you in developing your practice and should have a program guiding advisors to increase thier credibility, referability, sales and overall enjoyment of thier practices. If you ask advisors about their wants and needs, they rarely say they need "sales training." After all, if they've been in this business any length of time they've probably made sales and don't think they need any sales training or improvement. It doesn't matter if you've been in the business 2 years or 20 years, by incorporating Neuro Linguistic Phrasing into your sales presentations, you will have more meaningful interactions and not waste your time with unqualified prospects. A willingness to learn and continually improve is what separates the good producers from the great ones. Look for an IMO that offers programs to improve your non-traditional sales techniques. To elevate your practice and compete with the brand-name financial firms, (you know who I'm talking about) you need to have professionally developed branding and marketing materials that help convey why you are in this business and how working with you solves your prospect's financial concerns. Unfortunately most producers and insurance professionals aren't trained in graphic design, and trying to do it on your own means there is a high probability your materials will not convey the professional image you desire. Additionally, many IMOs don't offer this service either, and for good reason...it can be really expensive. You need to start with logo creation to convey your brand. When working with a professional graphic designer, you should expect to pay between $75 - $150 per hour of design time, and it could easily cost you up to $2,000 for logo creation alone. Once your logo is done, you then need all the various pieces you'll put in front of your prospects and referrals which means you'll need to have your brochure, firm bio, personal bio, planning process, letterhead, business cards and envelopes designed. This requires knowing not only how to professionally design the materials, but also knowing what content should be included. Just having those items created -- not printed -- would easily add another $1,000 or more just to have the design work done, and guess who's responsible for writing your brochures -- you -- which means taking time away from visiting with prospects and referrals. Your IMO should have some design services available to help you grow your business with little or no cost. 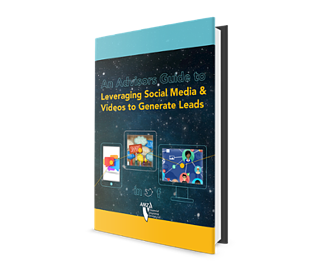 Ninety percent of buyers say watching a video is important in the buying decision. That's why more and more people today go online to conduct research, and they crave videos over written content. If you have a website or social media account (Facebook), you need to make it stand out from the crowd. One of the most important pieces you need to use to convey who you are and what you do is a professional consumer-focused video. To create professional videos you need more than a smart phone and a teenager. You should work with an IMO that offers professional video production opportunities that will increase your visibility online. Your IMO can't be a one-trick-pony and purely push product. Sure, access to product is important, but today advisors need additional partnership resources that have been vetted to ensure long-term success. So look for an IMO that has partnered with a Broker/Dealer (B/D) and a Registered Investment Advisor (RIA). If you simply want to expand the offering of financial vehicles within your practice, yet still maintain your insurance operations without facing challenge after challenge, you need to have a BD or RIA that understands the vital role of insurance and annuities in an overall financial plan. In order to grow, you need to surround yourself with people who are doing things better than you. In other words, you need to be challenged and provided the opportunity to have meaningful interactions with the best producers out there. Many IMOs may hold "national conferences" and some might even feature their "best-of-the-best" on stage, but sometimes there are more meaningful interactions between producers in the hallways than what's being delivered from the stage. You need to find a way to network, build trust and share business ideas in an environment that makes that all possible. Look for exclusive meetings that have been proven effective in increasing an agent’s production and provide the opportunity to network with the best-of-the-best. Meetings that bring top producers together are a unique way to share ideas, build stronger relationships, learn best practices and have some fun. Every IMO out there should have some product experts you can tap for case design. That's a pretty standard requirement, however, what separates the best IMOs is actually finding one that has worked with insurance companies to build insurance products. IMOs with the knowledge in house needed to develop, price, and manage life and annuity products can be extremely helpful. This enables them to not only determine which products will perform the best long term, but it also allows the IMO to go directly to insurance companies and assist them with all of their product development needs. So, as you look to the new year, go through this list and compare it to your current IMO. If you want next year to be your best year ever, you should choose a company with a proven track record of success in all 8 of these areas. Do you know how to effectively use social media to market and grow your financial services business? Fill out the form below to request the ebook that details the steps you need to take!